This week, The Broke & the Bookish’s Top Ten Tuesday feature challenges us to pick one of the topics they have already covered. Since I am a huge world building junkie and didn’t get a chance to do this prompt the first time around, I am going with the best vivid worlds/settings in books. 1. Luthadel: from the Mistborn trilogy by Brandon Sanderson. You guys – this man is the fantasy genre’s king of world building. It seriously does not get any better than this. If you’re a high fantasy fan and you haven’t read these books, you are doing yourself a serious disservice. The setting is so vivid and detailed, and the magic system hands down the coolest I’ve ever come across. 2. The Wizarding World: from the Harry Potter series by J.K. Rowling. An obvious choice, I know. But I can’t help it! If I could choose to go anywhere, this is where you’d find me. First stop? Weasleys’ Wizard Wheezes! 3. 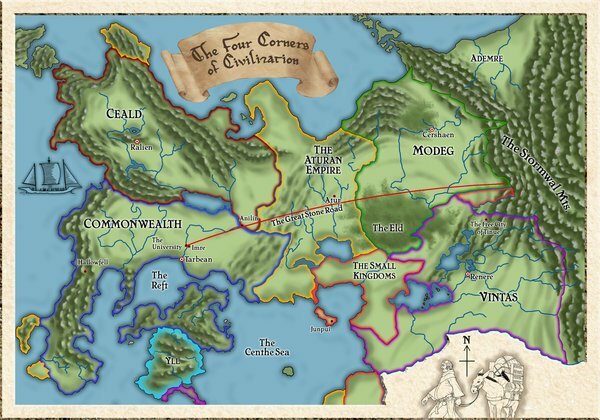 The Four Corners: from The Kingkiller Chronicles by Patrick Rothfuss. This would be my next stop after Hogwarts. Kvothe, the main character, does a fair bit of traveling – and I can so easily imagine every single place he goes thanks to the eloquent and beautiful hand of Patrick Rothfuss. From traveling as a trouper to living homeless in a city to attending university to hiding out in a wayside inn…I can picture it all so clearly. 4. Le Cirque des Rêves: from The Night Circus by Erin Morgenstern. I have never been that interested in going to the circus, y’all. But this one? HELL YES. I feel like I actually have been there really. I tasted the food, smelled the air, felt the clouds, experienced the magic…this entire story blew up my senses (I know that sounds painful, but I mean it in a good way). 5. Terre d’Ange: from the Kushiel series by Jacqueline Carey. Talk about some original world building, y’all. This one blew my mind. Steeped with an incredibly deep sense of spiritual and religious devotion, this place celebrates their deities in a very original way. Hint: it involves sexytimes. Lots and lots of sexytimes. Also rife with spies, poets, warriors and a healthy dose of political intrigue – this world is hard to forget. 6. Prince Edward Island: from the Anne of Green Gables series by L.M. Montgomery. These books were my childhood escape. No character can bring a place to life like Anne Shirley and her imagination. 7. Ancient Rome: from the Masters of Rome series by Colleen McCullough. I have only read the first book in this series, and it is massive. It also comes with a huge index. The research this author put into writing this series is staggering. The seriously impressive historical details cover every single bit of life in Ancient Rome. Reading it is quite an undertaking (I had post its full of notes everywhere while reading to remind myself of certain things), but so absolutely worth it. I honestly think this was the most memorable reading experience I’ve ever had. 8. 19th Century San Francisco: from Calico Palace by Gwen Bristow. The magic of the gold rush and the harried and dangerous lives of people living in California during this time are both brought to life beautifully in this book. I very much enjoyed seeing this glimpse into the lives of the 49ers. 9. Ancient Egypt: from The Heretic Queen by Michelle Moran. I absolutely love love LOVE books set in historical Egypt. Of those I’ve read, this is definitely one of my favorites as far as bringing the surroundings to life. Temples, monuments, living quarters, furniture – so many things are described with lovely detail. 10. 19th Century London: from The Tea Trilogy by Jennifer Donnelly. This woman is a wordsmith of the first water. Absolutely no one can do what she can. I am always dazzled by the writing in whatever I read from her. In all the books I’ve read set in London during this time period (and they are legion), I appreciate her efforts the most. It only took a few sentences for me to be transported into the world and lives of these characters. I’m not a crazy HP fanatic, but I do have to say that Rowling created an epic setting in her series. I mean, hello, they created a theme park based on it! Awesome list! I loved the world created in Harry Potter and The Night Circus. I have the Mistborn series on my reading list. Heck yes to that circus, it’s amazing how it beings as just another place in the world but slowly takes on its own everything, becoming a real almost exclusive realm. Love Harry Potter’s world too. I have always wanted to visit Prince Edward Island, there are so many beautiful descriptions of it in the books that I would love to see it myself! This is my favorite Top 10 list today! I mean just with numbers 1 & 2 you had me ♥ I’ve just discovered Mistborn recently but it was an instant 5-star & favorite for me…and I mean Harry Potter may be an obvious choice, but it’s also a worthy one 🙂 Anne of Green Gables was a childhood favorite & I’ve always loved visiting PEI. And while I’m unfamiliar with the books you mention in numbers 7, 9 & 10 I absolutely LOVE Egypt, Rome & London! Spectacular choices, thanks for sharing! I also follower via Twitter. Love love love the Wizarding World of Harry Potter. Night Circus has been on my wish list forever! Mmm, good ol’ PEI. I’d love to walk down Lovers’ Lane and visit Walter’s trees at Ingleside. Great list.